Taking advantage of existing Behaviors is a great way to get a game up and running quickly. Eventually, however, you’ll come across a Behavior that you want to tweak, or you’ll want to implement functionality for which no Behavior exists at all. For these cases, you’ll need to dive into Stencyl’s Design Mode. Note: This article is mainly a "how-to" article that familiarizes you with our signature block-snapping interface. If you're searching for an article on how to "think" and tackle problems, that will be covered in a future article. Let’s continue with the vertical shoot ‘em up game we were creating in our last article. We’ll see how we can create a simple laser-shooting Behavior from scratch. 1) Go ahead and click the Create New button in the toolbar, since we’ll be creating a new resource. 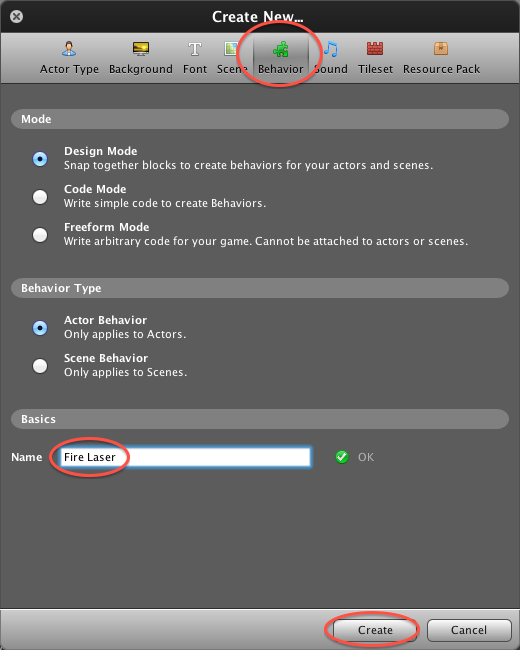 2) Choose the Behavior resource type, enter a name (such as "Fire Laser"), and click Create. Note: You might be curious about those other modes... Both are for advanced users. Code Mode lets you create Behaviors by writing straight-up code. Freeform Mode lets you add arbitrary code, entirely outside our Behavior system. After clicking Create, Design Mode appears. Let’s take a moment to get acquainted with the interface. The main interface is divided into three parts – the event pane, the workspace, and the palette. The event pane contains all of a Behavior’s events. The workspace is where you define responses to the currently selected event. It also contains a trash can for disposing of blocks that you no longer need. Lastly, the palette contains all of the available blocks that you can insert into responses. Reminder: Events are the building blocks of Behaviors. In short, they’re things that happen in your game that can trigger some kind of action, or response. Let’s go ahead and create an event that will let our ship fire a laser. 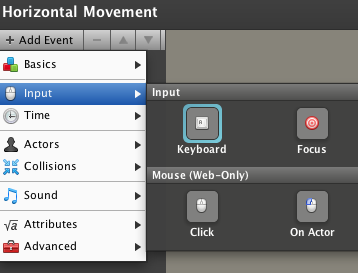 1) Click Add Event, and select Keyboard from the Input menu. 2) An Event wrapper block pops up. When the Event is triggered, any blocks placed inside the wrapper block will be executed. 3) Notice the two dropdown boxes. 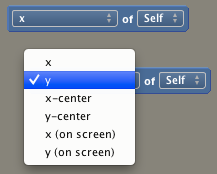 if you click on one, you’ll notice you can select from multiple options. Let’s first choose a control for firing the laser. Note: Controls are map physical keys on your keyboard to human-friendly names. If you flip to the Controls page under the game's Dashboard, you can see what physical key Fire1 maps to. 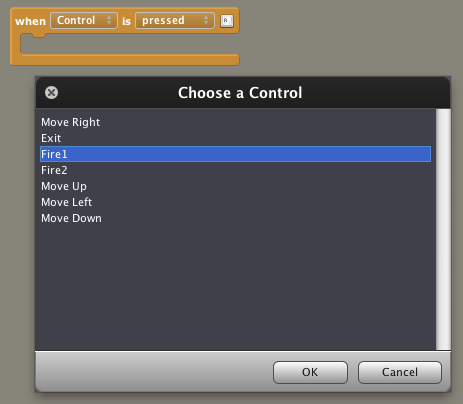 4) In our example, we have a Fire1 control defined. Select it from the list and then click OK.
Now we need to define the actions that should occur whenever the Fire1 control is pressed. These actions are called the Event Response. Specifically, we need to first create a laser Actor Type and then set its velocity. We can use the search box inside the palette to help find the blocks we need. Just type in a word that appears as part of a block’s text, and press Enter/Return. 2) While holding the Alt key, drag the x of [Self] block to a new location to create a copy of the block. Tip: Holding Alt and dragging a block will automatically clone it. 3) Click the x dropdown of the new block, and change its value to y. In words, we’re creating a bullet Actor 20 units above the player’s ship and are setting its vertical speed to -20 (meaning 20 in the “up” direction). Note: See this article if you’re wondering what a “recycled” Actor is. 5) If you want to test the Behavior out, attach it to your ship like we did in the previous article, or use the Attach to Actor Type button. That's all there is to building a simple Behavior. Assuming you know what kind of logic you're building, it's a matter of gathering blocks via whatever method you're comforatable with, filling in their blanks, and piecing them together into a functional stack that represents the functionality you desire. 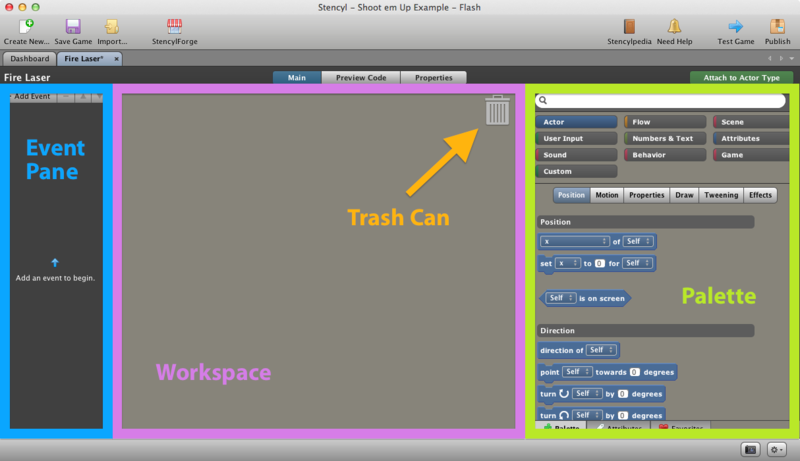 Stencyl’s Design Mode is divided into three parts – the event pane, the workspace, and the palette. The workspace is where you define responses to the currently selected event. The palette contains all of the available blocks that you can insert into responses. Blocks contain dropdown boxes and fields, which can be customized. The search box can help you find blocks quickly. Click and drag while holding the Alt key to copy a block. 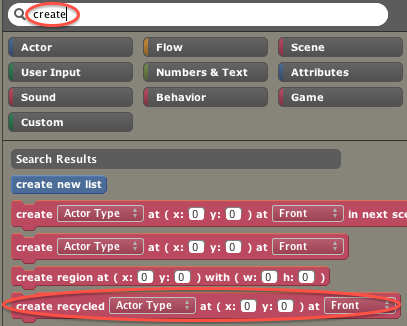 The Attach to Actor Type button is a quick way to assign a Behavior to an Actor Type from within Design Mode. Add a second event to the Behavior that causes the ship to fire a different weapon when a “special attack” control is pressed. how to create fire behavior, in the direction of the animation. please help, very grateful.how to create fire behavior, in the direction of the animation. please help, very grateful. how the enemy while walking toward to automatically shoot toward the right, toward the left, then shot toward the left, please help me, thanks. I don't have the event pane and the palette. The only thing I have is a workspace and a trashcan, and when I rightclick with my mouse I can't place a block. Can anybody help me?